Vervain mallow was once known only as a cultivated plant but has escaped gardens and nowgrows in the wild. 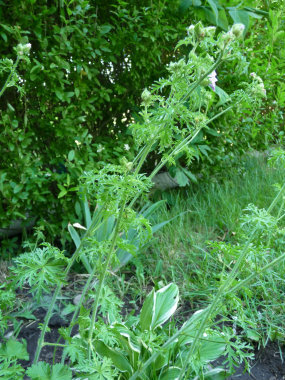 The stem of this plant contains a fibre that can be used to make cordage. Yellow, green and cream-coloured dyes can be obtained from this plant and the seed heads. The vervain mallow prefers sunlight and it prefers moist soil that ranges from a balanced pH to alkaline. Vervain mallow is a European native. Distinguishing Features: The flowers are very delicate in appearance and to the touch. They grow in terminal clusters with occasional solitary flowers on a long stalk. Heat and drought is not a problem for this plant and flowers will bloom even in drought conditions. 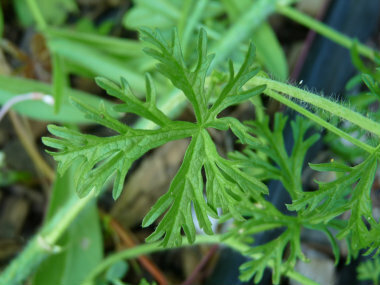 This herbaceous perennial can reach anywhere from 50 cm to over one metre in height and the stems are covered with stellate (distinct star-shaped) hairs. 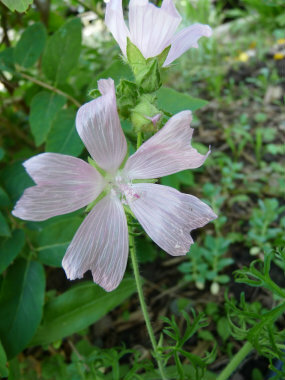 Flowers: The vervain mallow flower has five white to pink petals with five green sepals. Each flower measures about 3 to 9cm in width. The petals are somewhat ragged looking on the edges and are obcordate-obdeltate. The sepals measure about one third of the length of the petals. Flowers bloom (depending on location) anytime from late May to August and although the blooming period lasts one to two months, each flower is short lived. Fields of Nutrition has medicinal benefits and vitamin/mineral content of Vervain Mallow. Leaves: Leaves are alternate and have long petioles. Each leaf grows between 3 and 8cm long and across as well. They are palmately lobed (307 primary lobes each) and the primary lobes are moderately deep. The upper leaf surface is generally dark green and smooth and the lower leaf surface is light green and also smooth. Height: Vervain mallow grows anywhere from 50cm to over one metre in height. 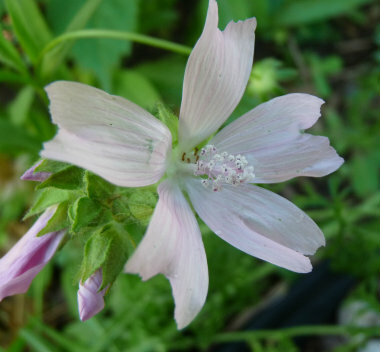 Habitat: This type of mallow prefers sunny locations or semi-shaded areas such as a light woodland setting. 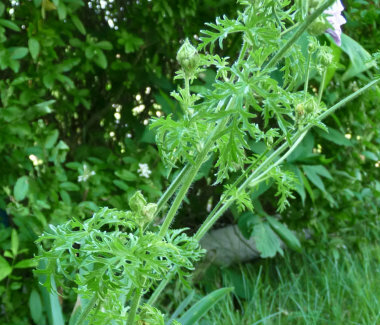 This plant grows in thickets and in waste areas. Vervain mallow grows in scattered areas across primarily eastern Canada (as well as Saskatchewan), northeast U.S., Great Britain, central and eastern Europe, and southwestern Asia. Edible parts: The flowers, leaves, and seed are edible. The flowers can be tossed into a salad. Leaves can be eaten raw or cooked. Hollyhock mallow leaves are fairly bland and can be used as a green in a salad. The seeds are rather tasty, somewhat nutty but are laborious to collect as they are quite small. Other name: Greater Musk Mallow. 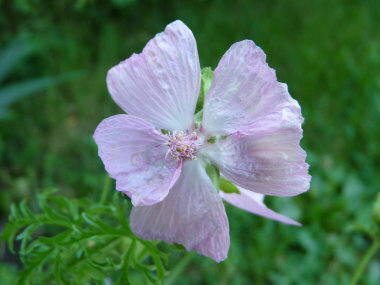 Similar plants: Musk Mallow (Malva moschata).